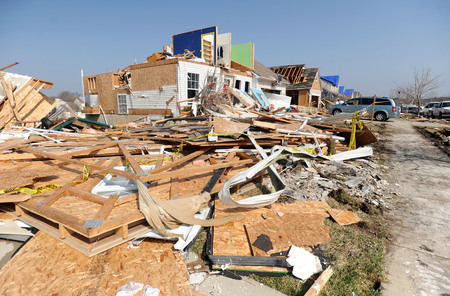 Posted on Sun, Mar 18, 2012 : 6:37 p.m.
School resumes Monday in Dexter, after classes were canceled Friday as the community recovered from a tornado that destroyed more than 100 homes. Superintendent Mary Marshall made the announcement on her district's web page on Sunday. The schools continued to be open during the weekend as a resource and destination for children, opening for 'gym and swim' events and as a destination for donations. It has been another busy and productive recovery day. I know we are all getting pretty tired. We have to remind each other of all of our blessings and start to monitor our rest and good eating habits. We have to take care of ourselves so that we can take care of our little ones. Thank you for all you are doing to help each other. What a community! Today we had another successful swim and gym at Wylie. Wow! What a turn out! Thanks to the volunteers who worked this event. We couldn't have done this without you. The kids had a ball. We have been asked to share some space for a community lost and found. This is a volunteer run space for community members to bring items they have found in the clean up and to check if they have items missing. Dexter Community Schools cannot be responsible for the safety of any of these items, as I am sure you can understand but we are happy to provide a space (with video surveillance) for this community exchange to take place. The lost and found is at Creekside Intermediate School on the North side in portable #2. The hours are 8:30 AM - 8:00 p.m.
We do need more volunteers for the sign up to cover the donation space and lost and found. Please click here. if you have time between 5 and 8 p.m to work at these volunteer run spaces. Now for the answer to the big question. Yes, we will have school tomorrow!! We worked with the Sheriff Department and the Road Commission to establish the following routing adjustments. Runs not listed here will be on their usual run and hopefully, usual times. Buses will run normally except for the following runs: â€¢ Huron Farms bus stops and pick up/drop off times will be the same as before â€¢ Dexter/Pinckney Road residents who live between 4165 Dexter-Pinckney Road and 4915 Dexter-Pinckney Road will be asked to bring their students to Samuel Drive@Parkridge Drive in the Westridge sub-division at 7:20 am and the students will be dropped off at 3:30 pm. The students will be riding bus #14 which will be the first bus in line at the bus hub (closest to Bates). If your child rides a shuttle bus to the hub please continue this process and have the students walk down the hill to bus #14. â€¢ Horseshoe Bend bus stops and pick up/drop off times will be the same. â€¢ Alice Hill bus stops and pick up/drop off times will be the same. The only change is that we will enter Alice Hill after picking up the students and turn around at the cul-de-sac. In the afternoon we will use the cul-de-sac as a turnaround and then drop off the students at the usual bus stop. â€¢ Meadow Creek bus stops and pick up/drop off times will be the same. â€¢ If you have a PM Kindergarten student in any of the above Dexter-Pinckney subdivision your bus stop location and pick up times will be the same. However it might be a different driver and bus number than you are used to. If this is the case, the driver will introduce themselves to you. â€¢ The district is also planning to have counselors ride the buses going through the Dexter-Pinckney area to assist with students who have not witnessed the devastation of those areas and may need to discuss their feelings and concerns. If for some unforeseen closures happen along Dexter/Pinckney Road during the day and we cannot get to the subdivisions as described above, we will send out an Alert Now Message announcing that we will use an alternate drop off location at the Dexter Township Hall. We will have supervision there until you arrive, but if you get such a call, plan to pick up your child at about 3:40. While traveling along Dexter/Pinckney Road our buses may be escorted by police cruisers. We are taking this precaution for added visibility in these areas. You may want to forewarn your child that this is for their safety and there is nothing to be afraid of. All school will have counselors available on Monday. Age appropriate responses have been planned for each building by members of our Crisis Committee. In another email to come at a later time, I will share details of this amazing group of people and how they respond in these rough situations - just awesome! Please contact your child's teacher or principal if you have any thoughts about how we can make the transition back to school as smooth as possible for your children. We look forward to joining you in working toward a normal routine, and with your help and support, tomorrow will be a big step in that direction. Mon, Mar 19, 2012 : 1:03 p.m.
What a beautiful letter. If my kids were still in school, I would be definitely be feeling well-taken care of. Here's to a wonderful first day back, Dexter. I am proud to call you home! Mon, Mar 19, 2012 : 5:55 a.m.
Wow! What an informative, compassionate, and complete letter from the superintendent. It seems the Dexter Community Schools has strong leadership and has really thought through everything. I hope the first day back goes smoothly. Mon, Mar 19, 2012 : 4:14 a.m.
How are the students who lost all their school belongings (books, homework, papers, pens, notes, etc) being helped? Mon, Mar 19, 2012 : 3:01 p.m. If the book bag is like my childs, it will be found somewhere under the bed. Intact. Trust me, I still can't figure out how children loose these things and then found in a closet or under the bed. Good to hear things are getting back to normal. Mon, Mar 19, 2012 : 11:45 a.m. Surprising a lot of he students school supplies are at school. K-6 mostly have everything at the schools, they don't take the stuff home every day. 7-12 once again should have most of there materials in there lockers, if not they just need to contact the school in which they attend and they will help out 100%. The houses that were totally destroyed the schools are helping them out with what ever they need. There is a list that all teachers have been given with students who was impacted the most. Sun, Mar 18, 2012 : 11:40 p.m.
A2.com staff: Just to let you know, we can't open the newest article about Dexter Twp $200,000: We're sorry but either the page cannot be found or there is system error.